Courtesy of the artists Gipsy Moon plays HumBrews at 9 p.m. on Friday, July 8. We're a county of music lovers, are we not? Here in Humboldt, we have our fair share of summer music festivals, which probably outdoes many counties with much larger populations. We're also unique — if I may — as we have a high concentration of local musicians who make the pickings for a local festival pretty prime. With that said, one of our most beloved music festivals is upon us. The 38th annual Humboldt Folklife Festival kicks off this Saturday in Blue Lake. Although not a die-hard folkie myself, my wife sits on the Humboldt Folklife Society board (full disclosure No. 1), so I've made it to a few. For some reason, I never before wondered why this festival happens in Blue Lake as opposed to the more populated Arcata or Eureka town centers. To answer that question, and many others, I sat down with HFS board member Patrick Cleary (one of my many bosses — full disclosure No. 2) at the Mad River Brewery on a recent sunny Friday. Over a happy-hour Jamaica Red, Cleary gave me the quick rundown of the Folklife Festival's history and how it actually began up on Fickle Hill many years ago at the Lazy L Ranch, moved to the Adorni for a year and then found its current home in Blue Lake via Dell'Arte about 15 or 16 years ago. Feel free to ask him for the full story when you see him. Not only do I love how this festival is completely local, but also how it rotates new musicians and new bands into the lineup each year. Cleary speculated that this year's festival will be about "50/50" in regards to the returning bands and new ones. As mentioned, I'm no die-hard folkie, and the Folklife Festival — thank Jah — doesn't take a purist stance on what "folk" is, which may truly distress a few yokels out there, but allows the vast majority of us to appreciate the wide range of American popular music that still influences local musicians today. You'll of course find fiddles and banjos galore throughout the festival, along with a songwriter's night, country night, bluegrass night, a barn dance and a special tribute to that ol' Telecaster playin', backbeat lovin' rambler Merle Haggard. It's no small feat to continue a local festival for 38 years and keep the momentum going strong. Many of the volunteers are still the same folks who've been around since the beginning but fortunately there seems to be new blood coming into the organization constantly, which lends hope to the idea that 12 years down the road, when we finish the General Plan Update and the Rolling Stones are on their farewell tour, we'll be able to celebrate the golden anniversary of the Humboldt Folklife Festival here in sunny Blue Lake. There's a sort of musical double header tonight at the Redwood Curtain Brewery in Arcata tonight. Starting off around 4 p.m. is "One-Man-Psychedelic-Acoustiloop" rocker Holus Bolus who's kicking off a three state tour tonight. With live looping capabilities he'll slowly create a full band sound with splashes of psychedelic rock, and reggae grooves. The tail end of this free double header is Humboldt's favorite Beatles tribute, Silver Hammer, who'll be bringing the skelter closer to 8 p.m. tonight. Not too far away, over at The Miniplex with be Kiwi rocker Gate all the way out from New Zealand. Rounding out this 9 p.m. bill are two "multi-platform" artists from L.A., Gabbie Strong and Christopher Reid Martin with local support provided by Bandon Wayne's Ghoulhand. $7 for this four-band bill tonight. While at the Mad River Brewery this past Friday, I was apparently — and luckily enough — sitting next to a chap who turned out to be Kaptain Kirk. After a quick introduction he asked if I could help get his show listed on the NCJ Calendar via his smartphone — I couldn't. (Editor's note: Rest easy, Kap, it's in there.) However, let me do what I can here by sharing the information with you that he'll be playing at the Logger Bar tonight at 9 p.m. for free and you won't be disappointed. It's Arts Arcata so you know there'll be a lot going on around the Plaza starting around 6 p.m. with a lot of music happening in the stores. 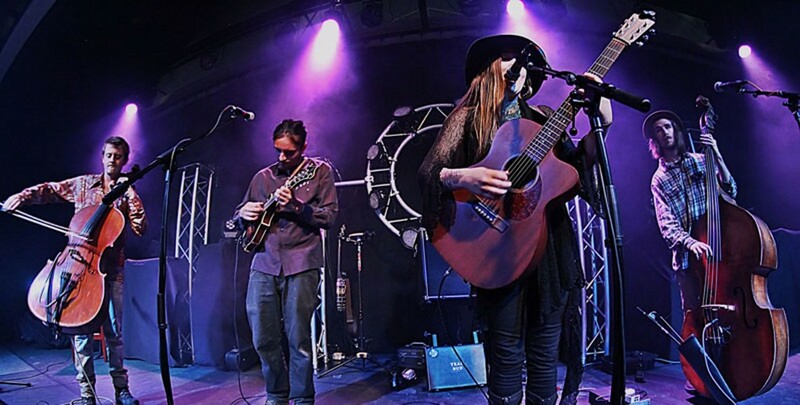 If you stick around Arcata, head on over to Humboldt Brews as it will be hosting rocky mountain Gypsy groovers Gipsy Moon at 9 p.m. You'll hear mandolin, guitar, banjo, bass, harmonies, etc. 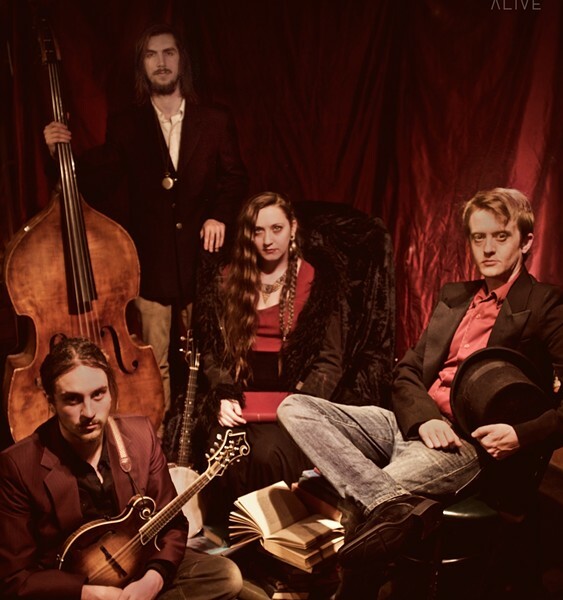 from these nature lovers who are "constantly reinventing their version of indie-folk to include Celtic melodies, Latin rhythms, jazzy vocals, bluegrass drive and a Gypsy swing that brings acoustic music into an exciting new dimension. A blending of genres that hippies and poets, lovers and dancers, freaks and families alike can all come together to sing and dance until the sun comes up." So there's that. $10 for this adventure. Kingfoot returns to the Logger Bar at 9 p.m. for free so that's the Blue Lake news for the night. The Humboldt Folklife Festival kicks off today, and you can find more information about this week long festival in our calendar section. But speaking of Blue Lake, at the Logger Bar, there's a new group playing. I'm unclear if this is a one-off gig, or if we'll be hearing more from this duo, but if The Dead are your thing, check out Shotgun Ragtime Duo, comprised of Piet Dalmolen and Norman Bradford, bringing you acoustic versions of your favorite Grateful songs. It's a 9 p.m. show and it's free. If you haven't found the time to catch Dee Hemingway at The Lighthouse Grill in Trinidad yet, now's your chance. She'll be there at 5 p.m. and won't be asking for any of your money — but feel free to share. Also, if you missed Silver Hammer and their local Beatle-mania earlier this week, you can find them for free tonight at the Logger Bar in Blue Lake at 8 p.m. Be prepared to sing along to your favorite fab-four ditties. Up from Los Angeles, '60s garage-blues rockers The Bloodhounds will be playing a rare and cheap show tonight at The Jam in Arcata around 10 p.m. for only $1. Before and between their rock sets, there will be some garage rock DJ sets to keep the tunes coming while the band takes a break. Wear your best worst denim. Andy Powell is a congenital music lover and hosts The Night Show on KWPT 100.3 FM weeknights at 6 p.m. Q: Why weren't there any banjos in Star Trek? A: Because it took place in the future.